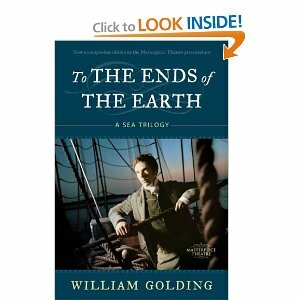 Late last night I finally made my "big winter book" decision, and chose William Golding's To the Ends of the Earth, a trilogy collected in a single volume. When I came across the book I felt certain even before taking it from the shelf that this would be my cold weather read. For one thing, the work was new to me. I've never read any of the three novels. Despite the many familiar books calling out to me to be re-read, I found myself in the mood for something new, albeit by a familiar and well-loved writer. Golding, that bleakest of English novelists, has never disappointed me and two of his books, Pincher Martin and, above all, The Inheritors are books I turn to often; The Inheritors is rarely far from my desk.. I have a fondness for The Spire, as well, and of course Lord of the Flies. Yet I had little knowledge of his maritime trilogy and was unaware until this morning that it was made into a Masterpiece Theater series a few years ago, but I never saw it, nor remembered hearing of it. I was glad of that -- I always prefer to read the original before seeing the adaptation. All of which is well-beside the point. It's Golding. I knew I would be in good narrative and philosophical hands. The trilogy is the story of a voyage, a journey from England to New South Wales on a vessel whose better days are behind her. The story is told in the first person -- in the form of journal entries -- by Edmund Talbot, a well-born young man bound for an administrative posting. The narrator is no seaman (especially in the heaves of the opening pages!) and is a passenger aboard the ship, not a member of its crew. It will be interesting, I suspect, to compare Talbot's sense of life at sea -- and Golding's presentation of it -- with Patrick O'Brian's novels of professional seamen. Finally, as I didn't discover until after I had chosen the book, and begun it, the first volume, Rites of Passage won the 1980 Booker Prize, edging out Anthony Burgess's Earthly Powers, one of the great novels of the last century, my favorite novels of all time, and a perennial all-season candidate for my re-read list. I almost took down the Burgess yesterday. But it was the Golding that I chose last night, and it was the right choice..
Fittingly enough for a literary voyage, the weather began to shift here not long after I selected the book, temperature dropping, winds rising, skies graying. Rough seas ahead, no doubt, and no doubt gloriously so. Like the narrator, I'll send dispatches as able. I've always used at least part of the long New Year's weekend to think about the books I want to read in the next twelve months. No less this year than others, and since the weekend extends through a Monday I've stretched the process, enjoying every moment of it. Snow days are the best of all -- with sleety days only slightly behind them. So I prowled my shelves last night both before and after midnight, and have continued to prowl and ponder all day today. I had thought for awhile that my top pick for the winter's first big book would be a revisiting of One Hundred Years of Solitude, which I haven't read in over a decade, and which has been calling to me for some time. But the more I thought about it, the more I realized that I wanted to save Marquez for warmer months, to read him in the shady glade near the garden on a sweltering day, maybe with a beer or two chilling in the creak near my garden chair. So I have continued to look, considering both old favorites that I haven't read in years -- Pynchon's Gravity's Rainbow, Oates's them, Bellow's Augie March from the century just past, James's The Ambassadors, Stendahl's Charterhouse of Parma, Dickens's Bleak House -- as well as some of the big books that I have yet to read at all -- Eco's Foucault's Pendulum, Bolaño's 2666, Styron's Set This House on Fire. So many books -- so little winter! I'll make my decision sometime tomorrow (I hope) -- and would welcome any suggestions from anyone who also shares the sense that cold winter nights and warm long books are made for each other.